This is a bonus edition of the Catholic Nook coming your way on a *Saturday* because of the 7 posts in 7 days blogging challenge. I have to admit, I'm getting a bit exhausted of blogging :0 but when I make a promise, I stick to it. You're welcome. I wrote about Ash Wednesday this week, and thus I thought another post in this pre-Lent series I'm doing about Lenten traditiona would be a nice touch. So here we are: Laetare Sunday, what the heck is that? Originally, this particular Sunday marked the practice of the traditio symboli, or handing over of the Apostolic Creed to the catechumens (those who will be baptized at Easter). Some time later, this practice was discontinued and combined with the baptismal ceremony. Now we have RCIA and the Rite of Election and all that good stuff during Lent, as preparation for the catechumens and candidates.The Church has retained the rose vestments on this day, however, as well as the original joyful intent. Interesting, huh? 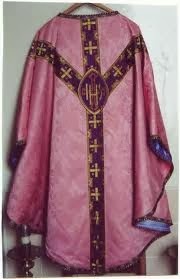 I may or may not covet a pink veil just to match the vestments for *2 days* a year. I'm admitting to nothing. Tomorrow I'm going to be putting a quick reading list of Lenten resources together for you. Do come back and visit me!